After bumping along at least 40 miles of barren and rutted dirt roads, I stepped out of the truck and shouted, ”Woohoo—there it is!” I couldn’t believe I was finally setting sights upon my third southern terminus of the Triple Crown trails, the Crazy Cook Monument. As I approached the Monument, hot air whipped across my face, a welcoming from the New Mexico winds. I unloaded my pack and tucked it under the shade structure nearby. I looked at it on the ground surveying all my gear one last time and noticed it seemed to already be smothered in dust and sand. Back in the desert again! Perk, Aaron and I snapped some terminus photos, threw on our packs, and took our first steps on the journey that will likely bring exciting and challenging times to our lives for the next several months. Can you see a trail? We couldn’t either. The trail started as a dirt path through brush and brambles, transitioned into a dirt road and then a wash. I saw quickly that there wouldn’t be much shade, at least in the first stretch, as there weren’t even any sizable bushes to note. I knew my umbrella would offer some reprieve from the sun, but I also observed the wind might challenge how often I could use it. I was already feeling a bit exhausted from the spurts of violent wind on the very first day, but reminded myself that it couldn’t last forever–right?! Later that evening, we found a bit of shade and sat relaxing for a while. I thought about how the first day of my other two thru-hikes felt pretty similar. Exciting. Nerve-wracking. Painful. A struggle. Emotional. I felt extremely grateful for the opportunity to begin the last leg of the Triple Crown journey, but was I ready for it to be over? Was I even ready for the challenge ahead of me? It felt like the girl who had climbed an icy Mt. Katahdin in 2015 and the one who pushed through record snow in the Sierra Nevada just months before had gone into hibernation. It’s interesting to look back at a thru-hike and wonder, “WOW! Who WAS that person?” It’s stranger to find yourself back in the middle of it wondering if she will come back. Then somehow when you just have to belly up away from the comforts of home and familiarity, a new “normal” sinks in. I reminded myself that it was this way twice before and that it would the same again. Just breathe. After a short day of hiking, it felt good to set my tent up that first night–a space that somehow felt like home even though I hadn’t been in it for over 6 months. We only hiked about 8.5 miles, but I had wanted to take it slow anyway. I asked Perk and Aaron how they were feeling, and we all agreed we should’ve had more water. Luckily, we only had about 4 miles to the first cache the next day but it felt pretty uncomfortable to already be rationing water. Rookie mistake! Perk decided to cowboy camp that evening and Aaron tried inversion sleeping. Just kidding, but he did accidentally attempt to set his tent upside down which made for a good laugh. His tent had come in just before heading to the CDT, so he hadn’t had a chance to practice setting it up. It was pretty similar to my duplex, so we had it up in no time. To my surprise, it was fairly warm all night and in the morning. I had expected the desert to be a lot colder in early April, but I wasn’t complaining! We reached the first cache in the late morning and I’m not sure I’ve ever been more thrilled to see a metal box full of water jugs. We ate lunch there and drank our fill. After packing up from lunch and hiking on, I found myself slowly starting to notice the beauty of the desolation surrounding me. At first glance, one might think they were suddenly dropped onto Mars, all hope abandoned. Upon further investigation, small signs of life revealed themselves. Sure, some of the most prominent signs of life I saw were cow patties, but they were welcomed indications nevertheless. By the third day of hiking, I started to get back in my groove. I didn’t take as long to leave camp in the morning, I had fine-tuned my packing and unpacking routine, and everything had its place. My body was still sore from the aches and pains that come from laying on a couch and then throwing yourself into a thru-hike, but it was starting to feel good. By the fourth day, I was downright excited to be on trail. I found myself singing, laughing and feeling much like my old trail self. Yes, it was hot, the constant wind was maddening, and my body longed for real food and a shower, but I was home and “Dixie” was back. That afternoon, we arrived at the road leading to Hachita, NM, where Perk and I had mailed a resupply package. As we hiked, we had toyed with the idea of just going to Lordsburg from there and taking a day to shower, run errands and eat. The closer we got the road the more those plans solidified. On top of that, Aaron had diarrhea, so we decided to go ahead and try to hitchhike to town. After an hour or so of unsuccessfully thumbing maybe 4 cars, I decided to message a shuttle driver through the InReach. In waiting for a reply, the border patrol pulled up and asked if we were okay. We told him that we were just trying to get to town and I asked if it was illegal to hitchhike in New Mexico (admitting that I should have already known the answer to that). He laughed and told us, yes it was legal, but he had just been concerned if we were okay. Apparently, one of the four cars that passed us thought we were stranded in the desert and needed help. I guess they were half right! The border patrol took us down to the Hachita general store to wait on the shuttle driver so we could at least have shade and Gatorade. Bucket list item: Hitch a ride with border patrol. Check. As we sped down the road in the bed of that truck, I grinned. If someone had told me 5 years ago that my life would be what it was at that moment, I would have laughed. I’ve always enjoyed simplicity, but never did I think I’d be so thankful for the bed of a truck or as indifferent to being stinky and caked with dirt. I was even excited for cow pond/trough water in the last stretch simply because it didn’t taste like a plastic jug. As I watched the asphalt move below us, I looked at my friends and realized just because a moment is inexpensive doesn’t mean it’s cheap. In fact, most of the best things in life are free. Happy trails and clear skies Dixie! Great read and awesome pictures. Keep it up! I’ll be following till the end. 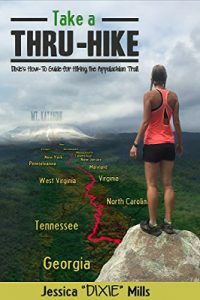 Dixie, thank you your presence for online source of hiking community has me attempting my first thru hike in just a few short days! Happy trails and keep the good vibe rollin! ???? Yayyyy! So happy to hear that 🙂 Happy Trails! I really love watching all of your videos. They are informative and entertaining. Love the blog entry. The videos are wonderful but the blog brings some depth into your trip. They compliment each other. Ultreia!! I’ve enjoyed following you through your Triple Crown pursuit. Thank you. Hey Dixie!! Part of this is entering your giveaway but the other part of this is to let you know that I’ve been praying for you while you are on your journey and all your buddies! Love hearing about all your adventures! Linda ???? Dixie, you are the reason I started hiking and spent all this money on this dang gear! You are an inspiration and I so wish I was out there conquering the CDT with you! You are such an inspiration. Thanks for taking that big step away from your corporate job, following your dreams and sharing them with us. Loving the CDT hike. Aaron is a “manimal”, Go Aaron! So glad to find ur blog. I have followed u on youtube since the AT and just found ur blog. Great work on both youtube, insta and here. Thank you for shering your experience. Love your pictures and your videos so much! I started backpacking because of you. Also Aaron is super hot! Amazing! I wish I were out there. I’ve never done a thru hike, but I do get that anxiety/what the heck have I gotten myself into? feeling the first 3 miles of every single backpacking trip! Love your videos, been following since PCT last year. Safe travels! I love the little patches of beauty that you find in such a desolate landscape. From the tiniest flowers to the spiky lizards to the flat landscape, everything is naturally majestic. Even the dead trees and bones hold a beauty of their own. I never hear you say anything about what you use to keep the mosquitoes and ticks away. Do you use anything? Hey Joe! I don’t use anything. I hear permethrin works great, though! Is their a reason you don’t use anything? I’ve seen you get chewed up by those little bitters in one of your videos….LOL …maybe in the Sierra on the PCT? Love the pictures! Glad to hear you’re doing well. It has been so fun following your journeys! I truly enjoy following your journey(s).They’re all so inspiring and I hope to do a thru hike one day too. Thank you for keeping me inspired and excited. I enjoy your videos so much and you get the credit for me planning to thru-hike the PCT next year. I’m working hard to overcome a couple of brain tumors that affect my quality of life and your videos have given me the inspiration to return to backpacking, a love since childhood. Thank you Dixie???? Please use my screen name “HopeSpringsATurtle” rather than my real name. Thank you. Love the blog posts and the videos. Brightens up my week every time I check either. Safe trails and happy hiking! A few lines of inspiration taken from a Dan Fogelberg song, Ever On.